Grace Gushiken is a prisoner at fourteen.Grace is confined on her father Kazuo's grounds. She, like him, is an esper: a reader of minds. Kazuo has arranged extensive training for her. Stealth. Infiltration. And combat.When a simple trip to the ancient city of Ise brings disaster, Grace tries to run. Her stunted esper abilities betray her. Kazuo turns Grace's friends against her. No one can stand against the power of his will.When her father is called away to meet the Emperor, Grace has one shot at freedom. She must brave the plague city of Osaka, steal a starship, and find a haven. If she can survive the nanobot swarms of a dead city, she might find hope among the stars. 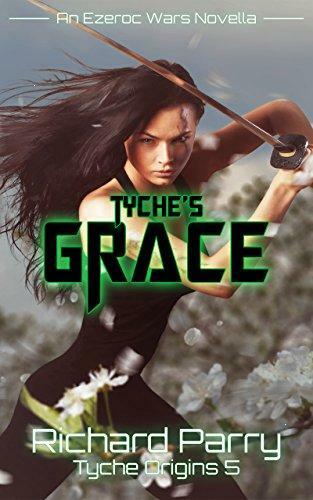 If not, she'll live as a mindless thrall to Kazuo's will.Tyche's Grace is the final novella in Richard Parry's gripping Tyche Origins pentalogy. If you like page-turning space opera with great dialogue and heart-pumping action, get your copy today!